The LG V40 ThinQ has taken its own sweet time to arrive in India, but it’s here nonetheless. Its five-camera brilliance and flagship-grade specifications make it a worthy competitor to some of the finest phones available in the market right now. Among them is the Huawei Mate 20 Pro (review), which too impresses with its triple-camera setup and powerful hardware. The two phones are very similar in some departments, but extremely different in others. Let’s give you a detailed comparison between the LG V40 ThinQ and Huawei Mate 20 Pro to make your job of choosing between them a bit easier. Both the phones are lookers in their own right. Their glass-based designs give them attractive appearances, but it’s the two-tone finish of the Huawei device that grants it the slight edge. The LG handset has a mid-sized notch despite its incorporation of dual front cameras, while the Mate 20 Pro features a wider notch. The display of the latter phone tapers towards the edges, which enhances its looks furthermore. Both the devices have full-screen front surfaces with their displays curving towards the edges. They moreover, come with IP68 dust- and waterproofing as well. The V40 ThinQ has an extra button on its side for summoning Google Assistant; something that the Mate 20 Pro doesn’t offer. The fingerprint scanner of the LG phone is a traditional rear-mounted one, while that of the Huawei handset has been embedded into its display. One thing that the V40 ThinQ can pride itself on is its inclusion of the headphone socket, which has unfortunately been removed from the Mate 20 Pro. This 3.5mm port is complemented by a Quad DAC as well, and the LG phone’s speakers are also powered by the DTS:X 3D Surround Sound standard. The Mate 20 Pro has regular stereo speakers in comparison. Both these phones sport HDR10-compliant displays. 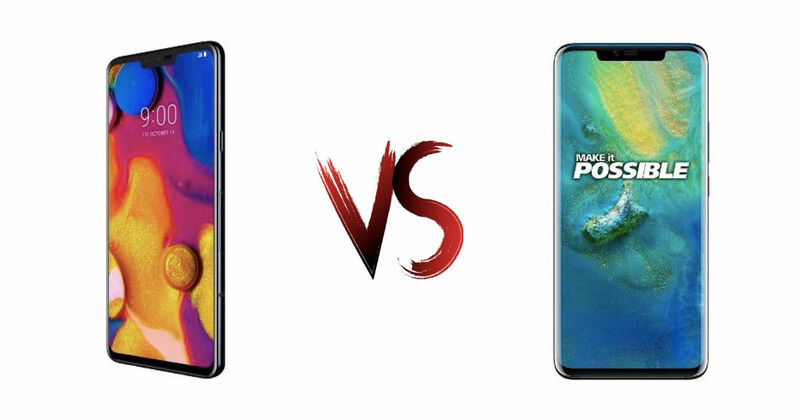 The one on the LG V40 ThinQ is a 6.4-inch P-OLED panel with a resolution of 3,120 x 1,440 pixels, whereas the one on the Huawei Mate 20 Pro is a 6.39-inch AMOLED screen with the same resolution. Top-notch hardware goes inside these two handsets. The Snapdragon 845 chipset, with its 2.7GHz octa-core processor and an Adreno 630 GPU, powers the LG device. It offers 6GB of RAM and 64GB or 128GB of storage. As for Huawei’s offering, it has been blessed with the company’s powerful Kirin 980 chipset. This 7nm silicon delivers the benefits of a 2.6GHz octa-core processor and a Mali-G76 MP10 GPU. Only its 6GB RAM model with 128GB of storage has made its way into India. That keeps both the phones on similar grounds when it comes to performance. LG has gone with its LG UX 7.0 software, which is based on Android 8.1 Oreo. This is a clean and straightforward interface with a few extra goodies like a floating bar with app shortcuts, context awareness for automated tasks and split-screen multitasking. The Huawei Mate 20 Pro on the other hand, runs Android 9.0 Pie-based EMUI 9. It’s got 3D Face Unlock as one of its main offerings, while there is other stuff like AI live models, 3D Live Emojis, HiVision (a Google Lens-like option) and gesture navigation. The triple rear cameras on the backs of both these phones are meant for serving the same purposes. One is for regular photos, the other is for ultra-wide shots and the last one enables telephoto zoom. The V40 ThinQ’s camera array includes a 12MP shooter, another 12MP telephoto camera and a 16MP ultra-wide camera. A Triple Shot feature allows you to click the same photo with all three shooters with just a single click. AI-based scene detection is also present on this phone. The Mate 20 Pro goes overkill (in a good way) with its 40-megapixel main camera, accompanied by a 20-megapixel ultra-wide camera and an 8-megapixel telephoto camera. This setup boasts an advanced Night mode, which tries to mimic Google’s Night Sight, and it even offers various video-editing effects. Coming to their front cameras, the LG handset ships with the combination of an 8MP main sensor and a 5MP secondary sensor. This setup is capable of offering wide-angle selfies to fit more people into them. 3D lighting effects and a portrait mode are also present here. The front camera of the Huawei handset is a 24MP unit, which comes with all the regular EMUI knick-knacks. A 3,300mAh battery sits inside the LG V40 ThinQ, while the cell inside the Mate 20 Pro is a large 4,200mAh unit. Both these phones support fast and wireless charging, but the Huawei handset has unique functionality that allows you to wirelessly charge other phones by placing them on its back. Both these phones are great all-round offerings that deliver everything you’d desire from a modern flagship, and then some more. That said, the asking price of Rs 49,990 invariably tilts the comparison in LG V40 ThinQ’s favour as the Mate 20 Pro will set you back by Rs 69,990.